Those indeed are seeds, and you can grow them! Camellias grow very slowly and can take years to bloom, so growing from seed is an exercise in patience. Let Seeds Ripen: Camellia seed pods typically ripen in early fall but can occur whenever camellias are blooming. Wait until the pods open before harvesting the seeds. One way to do this is to tie a bag of loose cloth (like cheesecloth or the end of a pair of pantyhose) lightly around the pod, so it will catch the seeds when they fall. Or you can pick them up off the ground. Mature camellia seeds should be brown, with a tough shell and an “eye” on one end. For help identifying camellia seed pods and seeds, check out this camellia identification guide from the University of Florida. Plant Immediately: Plant camellia seeds soon after harvesting. They shouldn’t be allowed to dry out, and some growers like to soak the seeds overnight before planting. If you must store camellia seeds, put them in the fridge in an airtight bag. 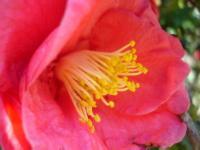 Planting Seeds: To plant camellia seeds, you’ll need a light seed-starting mix, or a mixture of perlite and peat moss. Wet the planting mix and squeeze out the excess water. Plant your camellia seeds by placing them on top of the planting mix with the eye facing either down or sideways, and cover lightly with soil. Cover the pots with plastic, and place them in a warm spot with bright indirect light (not full sun). Keep the soil moist but not soggy. Germinating Seeds: (optional) If you prefer, you can germinate camellia seeds in a plastic bag with a handful of soil, then plant them in pots once they germinate. This allows you to focus only on the seeds that are viable. Be Patient: Camellia seeds can take from one to several months to sprout, and they often sprout roots before leaves, so it takes even longer to see progress aboveground. Cut the Root. 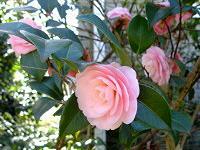 Camellias grow a long taproot that can be stunted if grown in pots. Once the plant has sprouts aboveground, it’s common practice to gently dig up the seedlings and pinch off the tip of this taproot, to encourage the roots to branch out into more of a ball. Allow to Grow: Camellia seedlings can take 5-7 years to bloom, and they likely will not be exactly like the parent plant. You can shave a year or two off the process by looking around under your camellias for seedlings that have sprouted on their own, and gently transplanting them to pots or into your yard. how much seeds do you need to plant a camellias, rhododendrons, and azaleas. We don’t sell camellia seeds on todayshomeowner.com, but Amazon, eBay and other web-based services do. We would recommend checking the web and verifying that they can deliver to Sri Lanka. Thanks for visiting the site! How could I vave some Camellia seeds please ?.I am Sri lankan Could you help me please. Gardening questions can be tricky since the rules can change based on the region. We would suggest contacting your local Master Gardeners association. Master gardeners train on a range of topics so they can provide advice, at no charge, for people in their area. After abt 50 years growing Camelias I’ve decided to try growing some from the large numbers of seeds on the Sasanqua. Just checking the best medium abd from what i see it’ll be best to go buy some seed raising medium. I have been raising camellias from seeds for a long time. I always pull them up after they have their second set of leaves. Then I cut the root in half and replant them. Mine are in VA and they often bloom within four years. They need a pinch of fertilizer out from the stem. Mine are over 10 feet high and I am still planting seeds. Good luck! I have been sticking those seeds in the ground and flower beds around my yard for years. I have 6-8 plants now and was wondering when they might bloom. Some are a couple of feet tall now. I live in the Mobile area.